This is one of Eastman's premier locations! 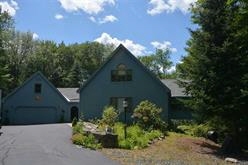 Waterfront with easy access to the lake, views to the water, and seasonal hillside views. The home is western facing so you can sit on the deck and enjoy the sunsets.This location is walking distance to the South Cove beach, the fitness center, and pool. This home is plenty big enough to host a large family and their guests yet there is one floor living thanks to the large master. The master has plenty of space, a walk in closet, and the bath is updated with granite and tile. The Great Room has an amazing floor to ceiling stone fireplace and vaulted ceilings give you that open feeling and windows and sky lights let the sun shine in!! The second floor has two ample sized bedrooms and large loft. Whatever you decide to use the loft for, you can still enjoy the lake view. The lower level has a huge family room with a wood stove, a large bath, bedroom or office space, a bunk room for the kids and large workshop/ utility room.